If you want a leaner belly, burn this into your brain first: Eat breakfast! Many people make fat loss out to be super complicated. You definitely want a multi-pronged approach (like combining smart exercise and clean eating) to whittle down your belly, but really simple concepts practiced persistently are what pay off over time. One of the easiest things you can do to start melting the fat off your frame is to start eating a breakfast EVERY DAY that boosts your metabolism and sets the tone for fat loss all day long. Seriously, would that be so hard? There’s protein and fresh produce in every example there. And very little prep/cooking time ;-). I bet you can manage these in the morning. Well, if you can’t Jayson, who is the Head of R & D at Jaylab Pro, has another suggestion. You can use a nutritious meal replacement shake like Lean. 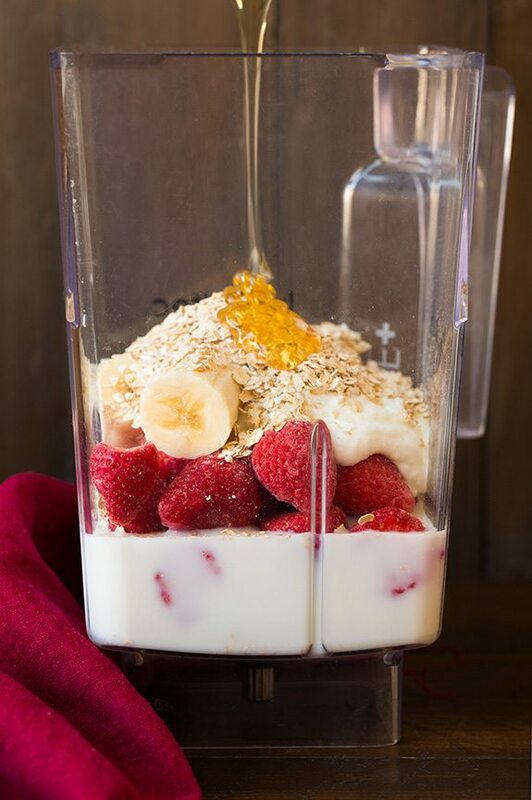 Blend it up with ice and the liquid of your choice and you’ve got a meal replacement that has been perfectly formulated with the right amount of protein, fats, carbohydrates and fiber. I use it myself and find it really has a delicious chocolate flavor. In fact, I hear Jaylab Pro spent 6 months developing Lean just to get the taste right. Ok, so there you have it — 4 EASY options for a Belly Fat Blasting Breakfast. Enjoy! PS – Here are 51 other recipes that you can try — with many of them being desserts. YUMMMM!! I consider quinoa a “superfood” because it is a complete protein, and it’s packed with fiber and other good stuff. 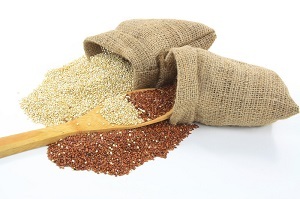 Quinoa is a slow releasing carbohydrate that gives you a full feeling for a long time. This is ideal for weight control and to maintain adequate blood sugar levels. It is a complete protein because it contains all 9 essential amino acids, and includes lysine, which is essential for tissue growth and repair. A cup of quinoa contains about 8 grams of protein, about twice that of other grains. Quinoa is a very good source of manganese, magnesium, iron, copper and phosphorus, making it especially valuable for persons which migraine headaches, diabetes, and atherosclerosis. It is a good source of riboflavin, which is necessary for energy productions within cells. Quinoa is gluten-free and is a great source of fiber. Cooking with quinoa is simple and is just like cooking rice. The most basic method of cooking quinoa is to boil it in water and simmer for 10-12 minutes. You need 1 measure of quinoa to 2 measures of water. All the water will be absorbed by the quinoa. Some quinoa has a coating of bitter tasting saponins. In that case, you need to pre-rinse the quinoa to remove this coating before cooking. Once you have cooked the quinoa you can add it as a base for meat dishes instead of rice. You can also include it in salads and soups. I recently used it in Minestrone soup in place of pasta. It will take on the flavor of the foods you cook with and adds its own little bite to the taste. Another way of incorporating quinoa in your meals is in the form of quinoa flour. Quinoa flour has a pleasant, nutty taste. It makes delicious bread, muffins, pasta, pancakes and more. When using quinoa flour in baking, substitute half the amount of all-purpose flour with quinoa flour, and then use all-purpose flour for the remaining half. Depending on the taste you are looking for in your baked good, you may want to use less quinoa flour than all-purpose. Experiment yourself and find what suits your taste buds best. First add the finely chopped onions, the minced garlic and sea salt to the olive oil in a pan or wok. Saute until onions are slightly brown. Then add chopped red pepper and continue to sauté until onions are caramelized. Add water, then the stock cubes and quinoa and bring to a simmer. Stir once after 5 minutes then simmer for 15 minutes until water has been cooked in. Enjoy Quinoa in your diet. Experiment by adding it to dishes where you normally use rice (think stir fries or soup). You’ll find it is a healthy, tasty addition to your meals! Healthy eating doesn’t have to be boring or bland. You just need to get familiar with the vast selection of herbs and spices available to you! Are you avoiding a change in your eating habits because you think healthy food isn’t exciting for your taste buds? Think again. Adding herbs and spices while cooking will add flavor to your meals and make eating healthy more enjoyable. Fast food or processed food may seem tastier than freshly made, nutritious food but usually it’s because fast food is full of sodium. Excess sodium is bad for your body in a number of ways. It may raise your blood pressure and it can cause you to bloat and retain water. Instead of relying on salt to add flavor to our meals, let’s take a look at other, healthier ways to create tasty meals. Herbs and spices both come from plants but the difference is that herbs are the green leaves and spices come from other parts of the plant. Spices can come from seeds, bark, roots or berries. You can find most herbs and spices either fresh or dried in the supermarket. To release the flavor in fresh herbs and spices you’ll want to cut or break them up before adding them to a dish. Dried spices have a higher concentration of flavor than fresh so recipes usually call for smaller quantities of dried spices. If you’re using fresh herbs while cooking, save them till the end so they keep more of their flavor. The highest concentration of flavor is found in extracts which are typically used in baking. Extracts are good because they add flavor without affecting the delicate wet/dry balance of a recipe. Grocery stores have a large selection of herbs and spices and it can be hard to determine which ones to buy. You can find fresh herbs in the produce section of your local store and dried herbs and spices down one of the aisles. Fresh herbs can also be grown in your garden or window box. If you choose dried spices, read the labels before purchasing. You can find individual spices or spice blends. Spice blends are great for marinating meat or as an addition to soups and sauces but some can contain high levels of sodium. Look for low salt or no salt options. 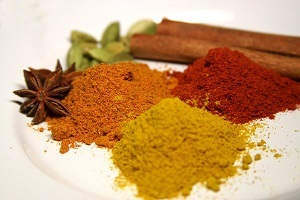 Several spices such as turmeric and cinnamon and garlic have been proven to have significant health benefits. Cinnamon – works well in a variety of dishes and shouldn’t be limited to baking or desserts. Cloves – use sparingly as they can be overpowering. Garlic – all purpose and can be used in just about any savoury dish. Oregano – great in tomato based dishes like pizza or pasta. Chili Powder – used to add a little spice and can stimulate digestion. Start by adding these spices to your pantry. If you’re just starting to add these flavors to your dishes, use a small amount at the beginning. You want the spice to add flavor but not overpower the meal. Once you’re more comfortable with the flavor it’s easy to experiment but you may wish to follow recipes closely in the beginning. Try adding something new to tonight’s evening meal and you’ll be pleasantly surprised at how great healthy can taste. Do you have a favorite spice you use in cooking? Share it here in the comments section! Late summer brings boatloads of zucchini to those of us who are home gardeners (or friends/neighbors of home gardeners). If you’ve got zucchini coming out of your ears right now, the healthy recipes I have for you here may be something you can use right about now! I mean, there’s only so much steamed zucchini you can eat, right? The first recipe here is one I adapted from a recipe in Prevention magazine. It’s on my menu plan tonight. I’ll serve this crispy baked zucchini with barbequed salmon and some roasted asparagus. I have the good fortune of having clients who fish for salmon near their Canadian vacation home (thanks KT and Brooks! ), so this is going to be one fresh, wholesome dinner! Can’t wait :-D.
1). Line a baking sheet with foil. Place egg whites in a shallow dish and stir slightly to blend. In another shallow dish, add panko, parmesan cheese and seasonings to taste and stir. 2). Slice zucchini into approximately 3” lengths. Then cut the 3” segments in half lengthwise. Slice the zucchini halves one more time lengthwise into quarters. Dip zucchini strips in egg white mixture and then roll in panko mixture to coat. 3). Place on a cookie sheet. Repeat with remaining zucchini strips. Bake at 400 degrees for 20 minutes or until zucchini are lightly browned. Fun taste treat: Dip baked zucchini strips in low fat ranch dip, marinara sauce or salsa. The second zucchini recipe I have for you I borrowed (with permission) from the blog of my friend and fitness colleague, Justin Yule. Justin runs a top notch fitness program in Chanhassen, Minnesota. If you want to read about a goofy holiday revolving around the dreaded onslaught of waaaaay too many zucchinis growing in your garden all at once, check out his funny blog post about what do do with all that zucchini at the end of the summer. This recipe is terrific if you find a HUGE foot-long zucchini in your garden (I swear, some of these things grow 5 inches overnight!). 2. Brush one side of each zucchini round with olive oil; brush the opposite side with pizza sauce. Evenly divide red onion, roasted red pepper, mushrooms, goat cheese, mozzarella cheese, garlic, and Italian seasoning over each zucchini round. 3. Grill zucchini pizzas over preheated grill until zucchini is tender, about 10 minutes. In our boot camp and personal training programs in San Jose, we’re always trying to show you new ways to eat fresher and healthier. These two recipes plus our fresh tomato sauce recipe from last week should help. Here’s to eating and enjoying all that our home gardens have to offer! If you’ve got a favorite zucchini recipe, feel free to share it here in the comments section. It’s hard to believe that we’re nearly 5 weeks away from the autumnal equinox. If you’re like many of my San Jose Bootcamp clients with gardens, you’ve got tomatoes and zucchini coming out of your ears! Today I’ve got my favorite tomato recipe for you. I only use it when I have home grown tomatoes on hand. It really works best with tomatoes from your garden or from a farmer’s market; store-bought tomatoes just don’t cut it for this recipe! There’s nothing like a homegrown tomato fresh off the vine. They tend to be juicier and more flavorful since they don’t have to be picked early and trucked into your local supermarket. So, in the spirit of enjoying fresh and nutritious vegetables, here is one of my favorite home-grown tomato recipes. It is packed with vitamins and it’s waist and taste-bud friendly. Combine all the ingredients and mix well. Serve over hot whole wheat pasta. Just so that it doesn’t cool down the pasta, I microwave the sauce for about 2 minutes before spooning it over hot pasta. I serve this pasta dish with homemade turkey meatballs and a side of steamed brocolli. If you’ve got a favorite home-grown tomato recipe to share, please feel free to post it here in the comments section! As you take advantage of summer’s tasty produce, what other healthy eating recipes make it to your family’s dinner table?